Forest officials are confronted with the spread of a weed that stifles tree growth but is useful for making baskets. SHOULD a weed that provides income to villagers be eradicated? This is the dilemma forest officials in Jhansi district of Uttar Pradesh face. The lantana bush spreads like a weed and threatens the growth of trees by competing for soil nutrients. But a poor villager can earn up to Rs 1,500 a month by weaving baskets out of lantana stems. Lantana camara was imported from America a century ago as an ornamental plant. In course of time, the weed, known as kuri in Hindi, spread on to agricultural fields and forest lands. The weed grows much faster than transplanted tree saplings, affecting transplanting operations. Lakhs of rupees are spent on eradicating the weed. The usefulness of lantana came about indirectly. About five years ago, the state agriculture department constructed bunds around the villages to hold rain water in order to develop the water table. With vastly improved water sources, the villagers sank wells and started growing tomatoes. Their were rewarded with bumper harvests, but did not have proper packaging to transport the tomatoes to urban markets. It was then the villagers decided to put the hated lantana to use. 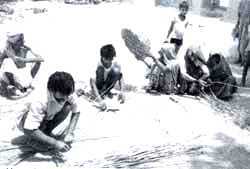 With their astuteness, they cut the lantana stems, removed the leaves and thorns and weaved them into baskets. Gradually, the baskets found a market for themselves, with the local people selling them in nearby urban markets through middlemen. The weed is also used as cooking fuel, in roofing and in fencing. Forest officials now auction the lantana out to local traders, while some villagers gather it themselves. Women normally cut the branches, soak them in water, clean and process them while the men do the weaving. A person can make 10-12 baskets a day and earn about Rs 50. During the harvest season, when demand for the baskets increases, weavers can make Rs 75 a day. But corruption is already rampant in this new trade. There are complaints of middlemen paying low prices for the baskets and of forest officials taking bribes to allow villagers to collect lantana stems from the forest. Some retailers say baskets are hoarded to be sold at higher prices when demand goes up. There are conflicting opinions on the weed's usefulness. Jhansi divisional forest officer Iqbal Singh suggests the weed should be allowed to grow only in drier regions. Other officials, especially those involved in field-level work, argue that lantana must be rooted out. Tejveer Singh, a forester in the Babina unit, says, "Unless the growth of the weed is checked now, it will be difficult to control its spread later."